We follow Early Years Foundation Stage (EYFS) Framework which is defined by the early learning goals. In both small and large groups children are encouraged to extend their vocabulary and fluency by talking & listening and by hearing & responding to stories, songs and rhymes. Children are helped to understand that written symbols carry meaning, to be aware of the purpose of writing and, when they are ready, to use drawn and written symbols for themselves. A well-stocked book corner gives every child the opportunity and encouragement to become familiar with books including handling them and making them aware of their uses, both for reference and as a source of stories and pictures. Within a nurturing environment, children are individually supported in developing confidence, autonomy and self-respect. They are encouraged to work and concentrate independently and also take part in the life of the group by sharing and co-operating with other children and adults. Through activities, conversation and practical example they learn acceptable ways to express their own feelings and to have respect for the feelings of others. 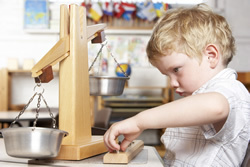 All children are given the opportunity, as appropriate, to take responsibility for themselves and also as a group, its members and children are assisted to learn and use the vocabulary of mathematics, identifying objects by shape, position, size, volume and number. Songs, games and picture books help children become aware of number sequences. 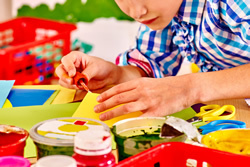 A safe and stimulating environment allows children to explore and experiment with a range of natural and manufactured materials. They learn to observe the features of objects and substances, recognising differences, patterns, similarities and how to share and record their findings. Children are assisted in exploring and understanding their environment, both within the group and also in the wider community. Children will learn to recognise that a range of technology is used in different places such as homes and schools. 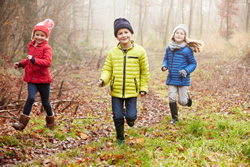 We allow children into the fresh air, with daily exercise, in order to encourage both free play and organised activities within groups. This encourages them to move confidently in a range of ways safely negotiating space. We support children in developing an understanding of the importance of physical activity .We encourage the making of healthy choices in relation to food and support children to manage their own basic hygiene and personal needs. By means of adult-supported practical experience children become familiar with sorting, matching, ordering, sequencing and counting activities which form the basis for early mathematics. As their learning progresses they begin to use their developing mathematical understanding to solve practical problems like dividing toys equally. The children are encouraged, through the materials available, to understand and explore colour, texture and to use their own creativity both indoors and out. They are allowed the freedom of choice to develop their own individual ideas, to investigate and act out emotional feelings. They experience the use of musical instruments, music itself and develop creativity in movement, dancing, role play and singing.